As Halloween approaches, stage blood takes the spotlight and chemistry tricks can treat viewers. (Inside Science) -- While most people think of stage makeup as big eyelashes and pancake foundation, Shannon Higgins specializes in a different sort of entertainment wizardry. "I make little teardrop-shaped baggies of fake blood and hide them around the stage for different productions," said Higgins, a hair, makeup and wardrobe supervisor at Steppenwolf Theater in Chicago. Actors then pocket the blood packets for use during the production. In a recent show called The Doppleganger, actor Rainn Wilson wore a mechanized blood suit that squirted blood, and other actors had squeeze bottles full of blood. The stage, said Higgins, became a bloody mess. There are lots of considerations when it comes to fake blood, which has come a long way since the days of chocolate syrup (used in Hitchhock's Psycho) or the classic combo of corn syrup and red dye. For blood that's in an actor's mouth, some new formulations taste like mint and are safe for ingestion. Other blood is washable -- something that matters a lot when a show is onstage for six to eight weeks, Higgins said. One stage blood formula created by British company Pigs Might Fly South was used in the Harry Potter films. "It's a good density," for movie and television blood said Higgins, adding that theater sometimes requires special sleight of hand. She has to bend the rules of normal blood behavior a bit to account for stage lighting and people who may be seated in the back of the theater. Wounds that would gush out quickly have to be slowed down it order to make them more visible for the whole audience. The audience view is also a major consideration for Anna Fleiner and Kelsey Boutte, who work on makeup and effects for the CBS show S.W.A.T. For gory crime scene inspiration, they scour the internet for photos of gore -- and then they adjust for the camera. "Sometimes what may look really real actually looks differently on camera, because of high-def cameras," said Boutte. "A red color that looks correct in person may be too bright on camera." Blood also changes characteristics depending on how new a wound is. Older blood is darker and more congealed than fresh blood, which is runnier and more flowing. There are many blood varieties on the market, Fleiner said -- there are formulations of eye blood, mouth blood, lung blood, old dried blood, and even blood for different skin tones. "We can just buy whatever works well." For those looking to create blood at home rather than buy it, there are some tricks to the process. A simple starting goo could be a mix of chocolate syrup, peanut butter and red food coloring -- a sticky, less drippy formula good for something like a zombie costume. The Kennedy Center has recipes for blood based on soap and corn syrup, as well as gels that can mimic organs. Blood looks red, but it's actually a reddish brown, because of an iron molecule bound to it, said Jennifer Fishovitz, a chemistry professor at St. Mary's College in Notre Dame, Indiana. "So red food coloring on its own is not the best; you'd need to add a green to make it a little more brown -- or use chocolate syrup to achieve a viscosity closer to blood." Fishovitz leads students through a fake crime scene every semester. While she has never used fake blood, she instead puts hemoglobin, one of the proteins found in blood, into water for her students to test. Jennifer Schwartz Poehlmann, a chemistry lecturer at Stanford University in California, uses a different trick in her chemistry classes. She teaches her students how a classic reaction -- mixing ferric chloride with potassium thiocyanate to make iron thiocyanate -- can create the illusion of a fresh, bleeding cut. You begin by coating an area of skin with the clear potassium thiocyanate solution. Then, dip a butter knife blade (or fake knife) in the ferric chloride solution and gently draw across the skin with the dampened blade. 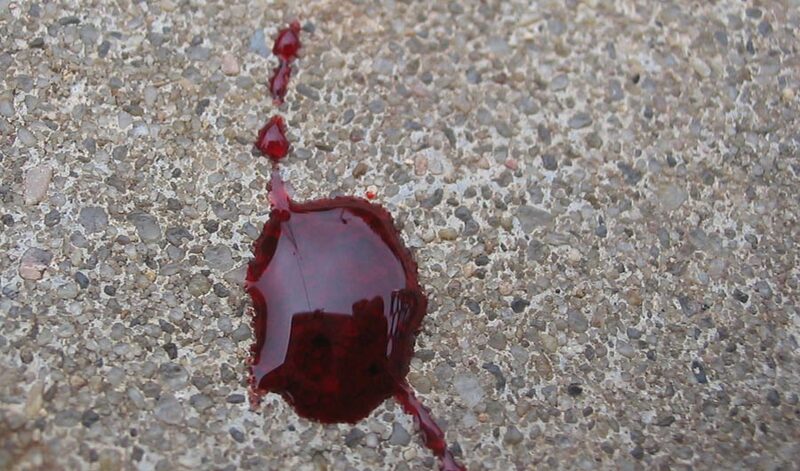 A deep, red liquid resembling blood appears where the two solutions mix. Leaving the skin damp after the first application produces a dripping blood effect, although the color from the reaction will still appear even if you let the area dry. "The coordinated iron compound gives a deep red color that nearly perfectly mimics blood," Poehlmann said. "It's slightly different from the heme iron in our blood but similar concept." So, from professional theaters to chemistry labs filled with budding scientists, there will be no shortage of stages on which fake blood can impress this Halloween.